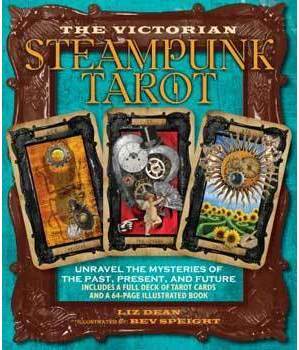 This innovative deck pairs steampunk and tarot, helping you to unravel the mysteries of the past, present, and future. Presented in a stylish steampunk-style box, with cutting-edge illustrations by Bev Speight, it is a truly unique approach to tarot that perfectly encapsulates the steampunk spirit. The accompanying book explains the meanings of all the cards and explains how to lay them out and read them. Both tarot aficionados and beginners will be drawn to and inspired by this wonderful deck. It will spark your imagination and intuition and help you realize your destiny.